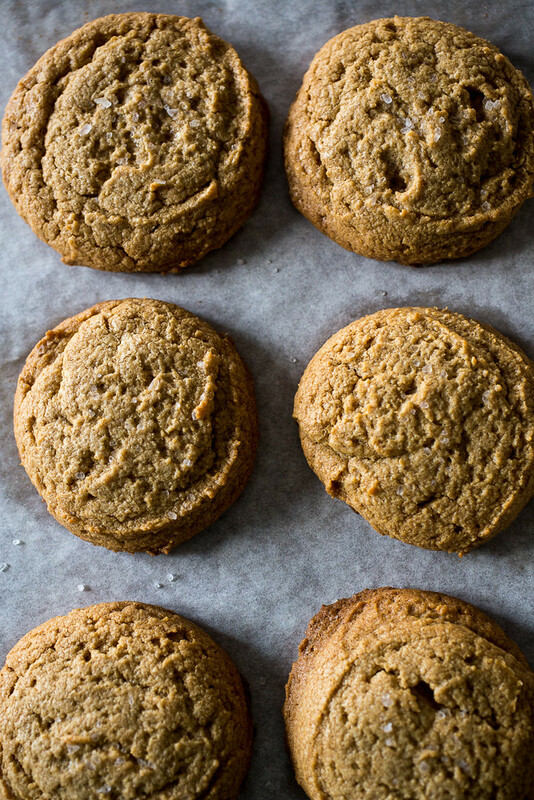 With their salty high-top domes, distinctive ridges, and fluffy, chewy interiors, these salted peanut butter cookies, hailing from Brooklyn’s Ovenly bakery, will knock your cookie world off its axis. And for me, that’s saying a lot. I’m not gonna lie. There are some days when I sit at my desk at work dreaming about cookies. And it’s distracting! Chocolate chip, of course. And sugar. And cookies with cornflakes and marshmallows. And oatmeal toffee. Ummm…and giant double chocolate too. But in all honesty, I think it’s peanut butter cookies that I’m almost always craving. For years, we made and remade this honey roasted peanut version and while there was nothing wrong with them – big, soft, with crunchy bits of honey roasted peanuts studded throughout (delicious!!) 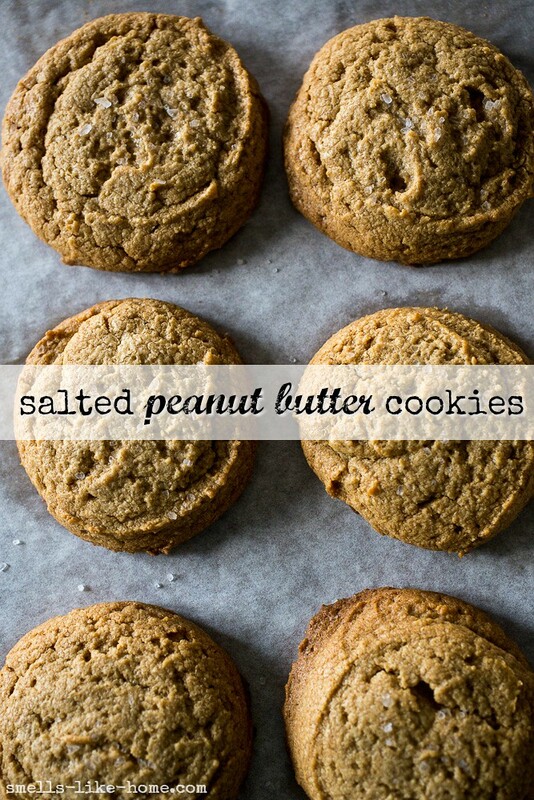 – when I first started seeing these salty peanut butter cookies cross my path a few years back, with their towering domes and distinctive ridges across the tops – immediately indicating they were from the Brooklyn bakery, Ovenly – I knew I needed them. And after I made them – all 3 ingredients not including vanilla and salt – I couldn’t tell you how fast they disappeared. For reals. The same thing happened the all of the other times I’ve made them too. Within hours, maybe. No flour, no butter, no baking soda or powder. Just peanut butter, brown sugar, eggs, vanilla, and a sprinkle of coarse sea salt over the tops before baking. So freaking simple!! The result is soft and chewy interiors with just a lightly crackled outside edge that’s got “those Ovenly ridges,” as I like to call them, and a punch of salt. 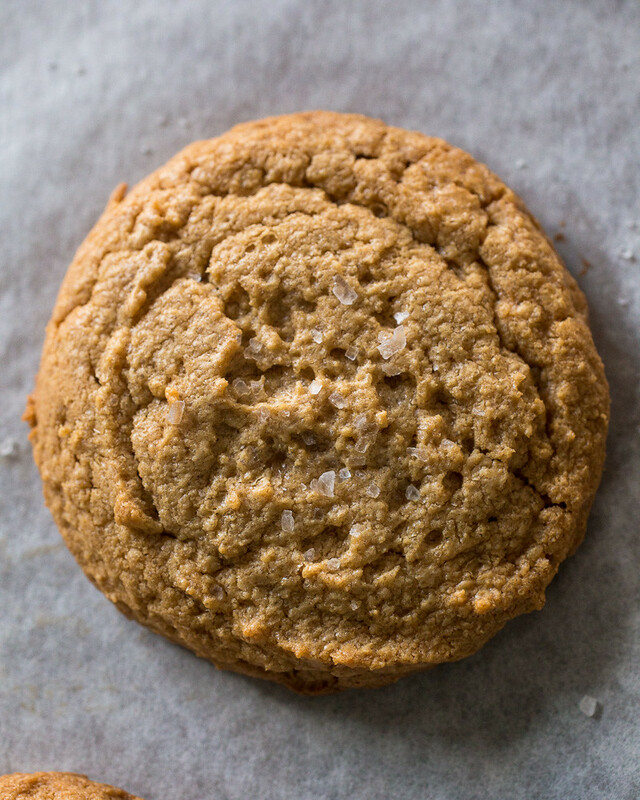 The key to the ridges and towering domes of these salted peanut butter cookies is to chill the dough for at least 15 minutes before and after scooping. That’s the hard part because not only do you want cookies like rightthissecond but the dough is phenomenal and resisting it is almost futile. So go on. Go ahead and cobble together your 3 ingredients right now and get these puppies in the oven. 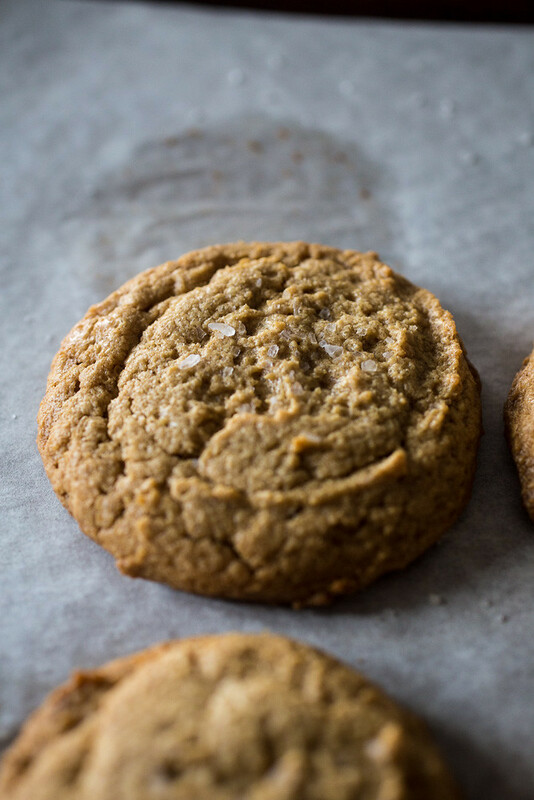 You’ll never look at another peanut butter cookie again. Wish I were even kidding. The key to getting those rigged, crackled, and domed tops is to chill the dough before scooping it. Be sure to give the dough at least 15 minutes in the fridge before you scoop it and then pop the dough-lined cookie sheets in the freezer for another 15 minutes before baking. Preheat oven to 350° F. Line two large baking sheets with parchment paper. In a large bowl, whisk the sugar, eggs, and vanilla together until fully incorporated. Add the peanut butter and whisk until no streaks of peanut butter remain in the batter. If you don’t care much about the ridges, don’t bother chilling the dough at all. Otherwise, chill the dough for at least 15 minutes, stirring occasionally to prevent the dough from sticking to the sides of the bowl. The dough should be just firm enough to roll into a ball when you go to scoop it. Using either a large cookie scoop (about ¼ cup or #60) – what I used for these cookies here – or a medium scoop (about 1 ¾ tbsp), scoop out the dough into balls on the prepared baking sheets. The tops should show those nice ridges/striations; if they don’t, continue to chill the dough for a few more minutes and then re-scoop. Freeze for another 15 minutes before baking. Sprinkle the dough balls with some salt and bake for 18-20 minutes for the large cookies or 14-15 minutes for the smaller cookies. The edges should be golden brown. Cool the cookies on the pan for a few minutes before transferring them to a wire rack – they’ll be pretty soft when still hot. Allow them to cool completely before eating. I am so excited to make these tomorrow!!! I hope they turned out great for you, Sarah!! These look so so good! Def am going to have to try them!!! Kayle, I swear, you will FLIP over these cookies! I am sure I am totally missing this, but when do you sprinkle the salt? before or after baking? Sprinkle with salt before baking – sorry I missed that instruction! I just added it to the site. Thanks for catching that, Sarah! Hi Juliana! Thanks for coming back to leave a comment! With only 3 ingredients in the recipe, I would caution about reducing the sugar as this will likely alter the consistency. Instead, you might want to try a peanut butter with less sugar than you normally use as sugar content tends to vary between brands.